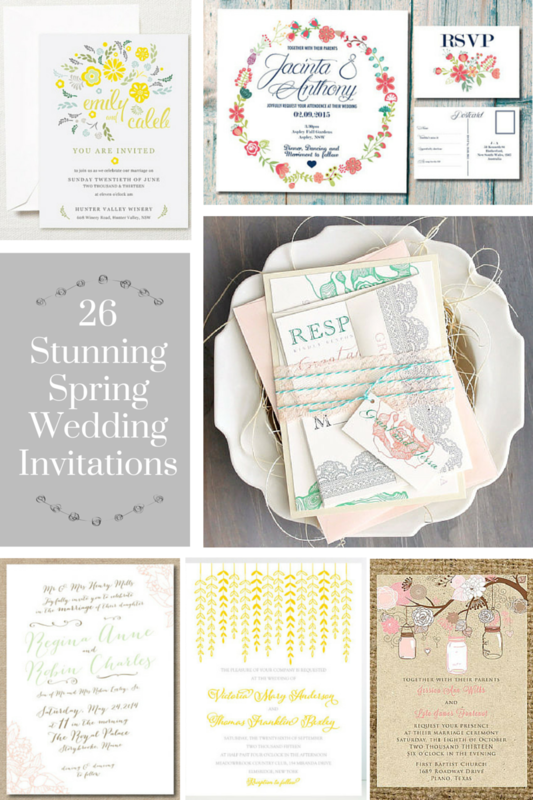 Since wedding season is just around the corner I thought today would be the perfect day to share with you 26 Stunning Spring Wedding Invitations. And since I have just opened my own Etsy shop I thought it would be perfectly fitting to share invitations that were created by other Etsy shop owners who take pride in their handmade & handcrafted designs. If I wasn’t already married to the most wonderful husband I would wish that I could go back in time & pick one of these beauties as my wedding invitations. The only problem is that all of these invitations are so beautiful I wouldn’t be able to choose just one! 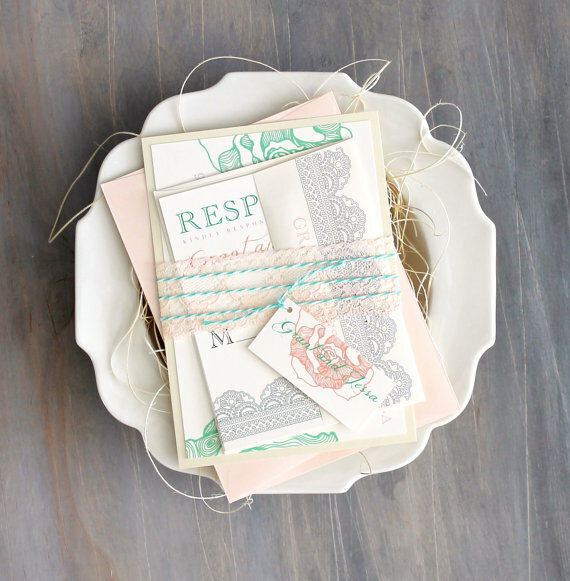 Every romantic heart will fluter & there will be instant invitation envy when your guests receive this Ruffled Romance Mint Invitation in the mail inviting them to your special day. Beacon Lane has perfected their wedding invitations & have a wide variety of other beautifully designed paper products, including save the dates, programs, & thank you cards on their Etsy shop. 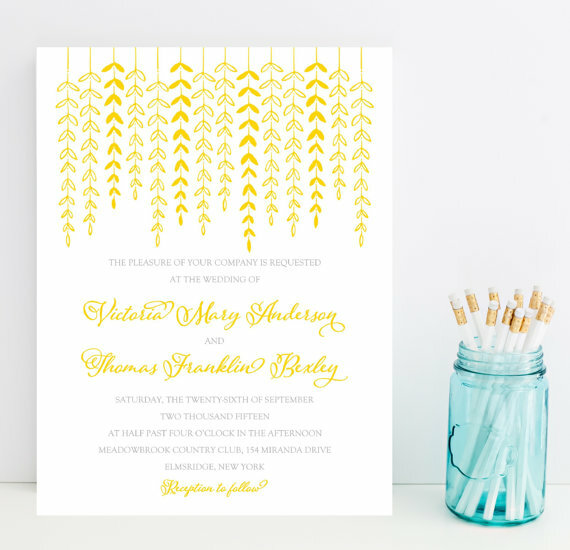 There is something so light & refreshing about these Yellow Wedding Invitations in Botanical. These invitations emulate a wedding that will be filled with bright love, joyful happiness, & an elegant evening. If I received this invitation by Zest & Lime’s inviting me to your wedding I would be counting down to your joyous day! 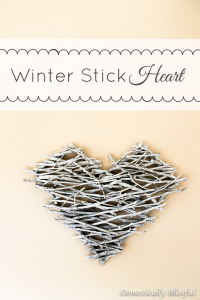 I am completely in love with Remember November Inc.’s Etsy shop! 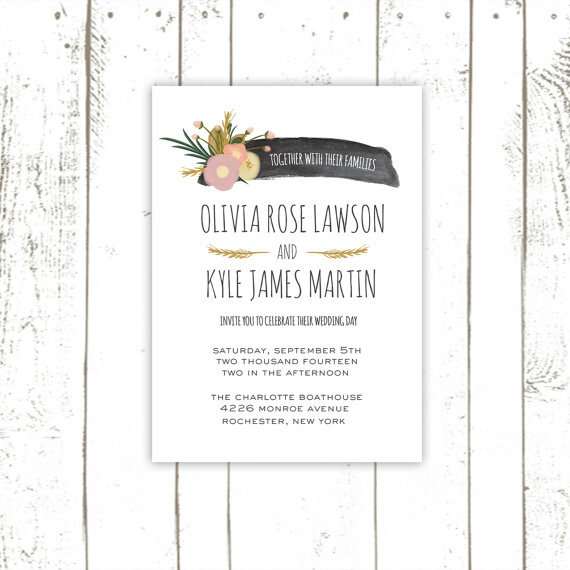 If you love this Printable Wedding Invitation you will love her Wedding Signs & Programs that also incorporate these beautiful flower designs along with many chalkboard designs. 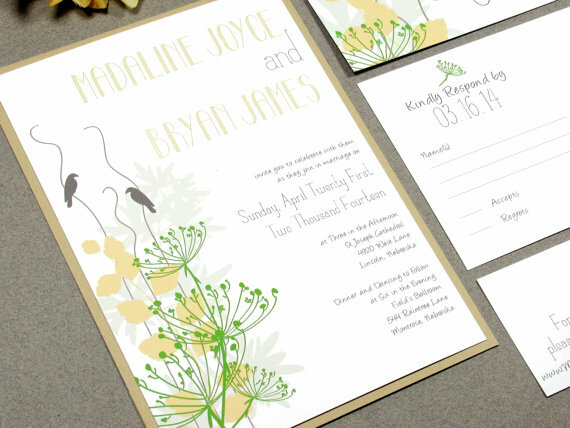 If Jane Austen were to create Blossoming Spring Wedding Invitations for Elizabeth Bennet & Mr. Darcy they would look exactly like Bwnola’s design. 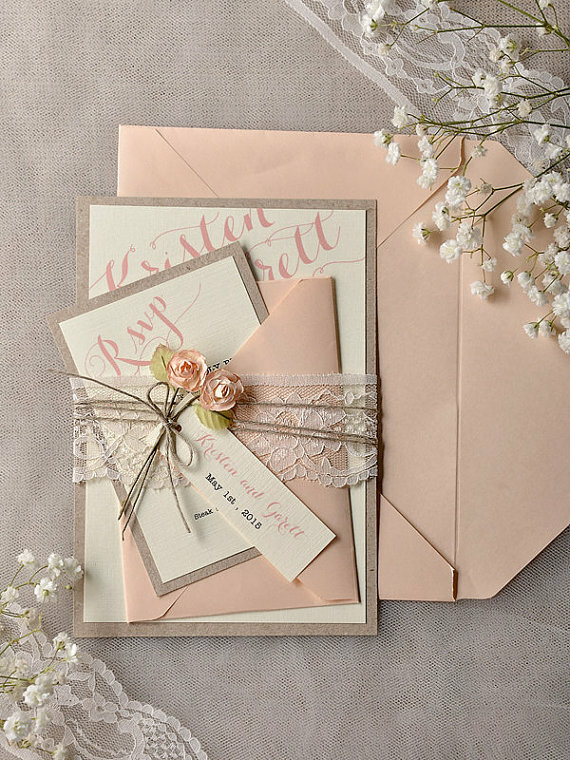 The beauty in these invitations can be found in the soft colors, elegant font, & the delicate flowers. Love Story Invitations have created the perfect square invitation for your happily ever after. Leave pastels behind with this bright & beautiful wreath of flowers that surround these hand designed Vintage Garden Wedding Invitations. I especially love that this Etsy shop is dedicated to sharing your love story in the form of your dream wedding invitations! From Leoni with Love has the most adorable Rustic Wedding Invitations with 3D bunting at the top of each handmade invitation. Her handcrafted invitations can be customized by choosing your favorite paper & bunting colors, making your invitations one of a kind for your special day. 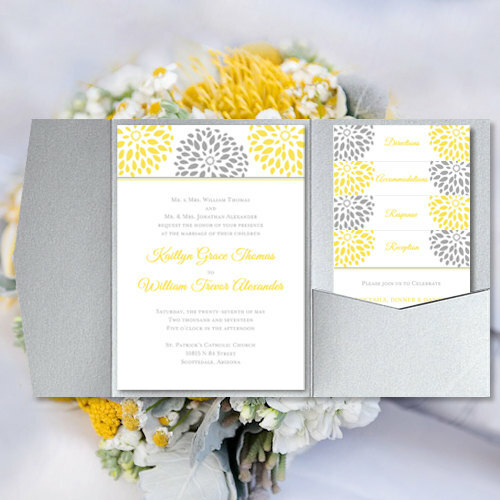 Pocket Fold Wedding Invitations “Floral Petals” are a simple yet incredibly gorgeous example of the perfect yellow & grey themed wedding invitation. 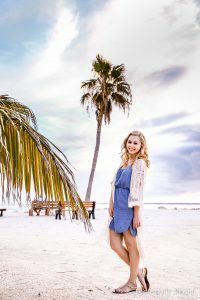 Wedding Templates Etsy shop has everything your heart could possibly desire in the way of paper products for your wedding including programs, menus, Instagram cards, & much more. 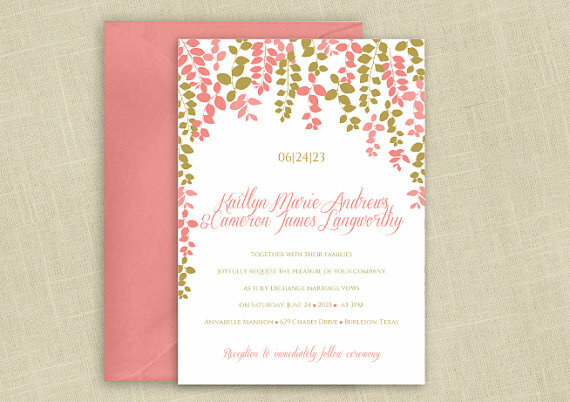 These Peach Wedding Invitations by Sweet Invitation Co.’s & are the perfect little invitations for a spring wedding. Each invitation will look like they were hand written by a calligrapher & crafted specially for each guest. Who says a spring wedding can’t have bright flashes of glittering gold? 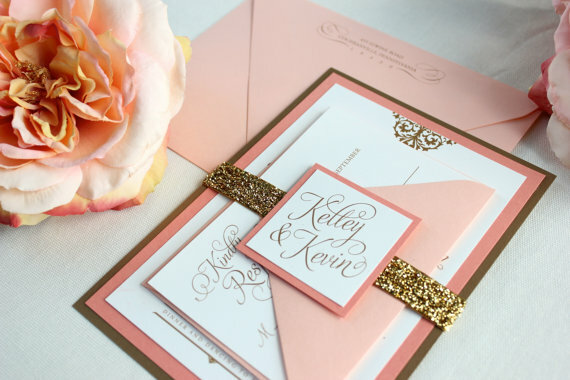 These Peaches & Creme Wedding Invitations by Love Jessica incorporate the perfect soft spring color scheme with a pop of glitter that will be remembered by your guests for years to come! If you are as infatuated with chalkboards as I am you will love these Chalkboard Wedding Invitations. 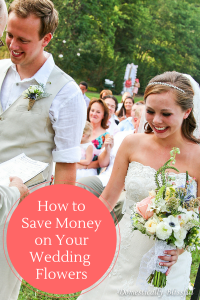 Mooseberry Paper Co. also has many other wedding products available in their Etsy shop including thank you cards, favor tags, & alternatives to guest books. 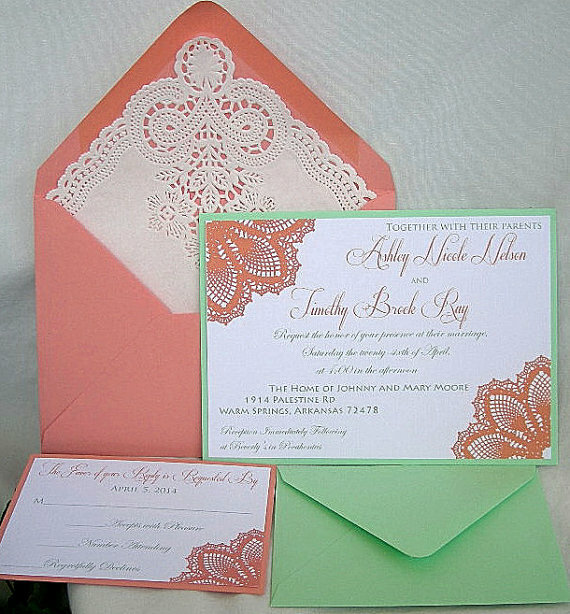 Doily lined envelopes are a special touch in these Peach Coral & Mint Green Wedding Invitations by All Things Angelas. I can imagine these being the perfect invitations for a vintage inspired spring wedding on the beach! These invitations are perfect for lovebirds looking for a beautiful natural rustic wedding invitation. Runk Pock Designs Rustic Wedding Invitation Suite are available in a variety of options & are handmade with environmentally friendly inks! This DIY Wedding Invitation Template is perfect for a DIY bride looking for a simple yet stunning spring wedding invitation! 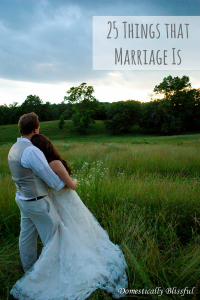 DIY Wedding Templates has a large variety of wedding templates that are downloadable for you to print at home. 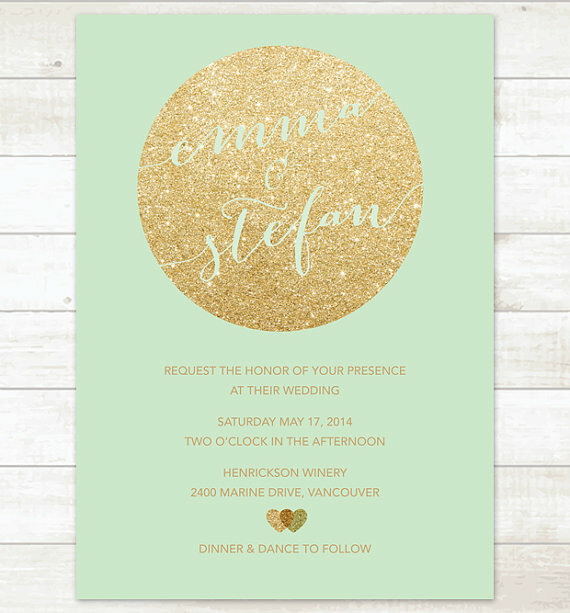 If you are looking for an invitation with a pop of sparkle look no further than these Mint & Gold Wedding Invitations! Pink Dahlia has a large array of beautiful invitations ranging from holidays, to baby showers, to weddings & more! 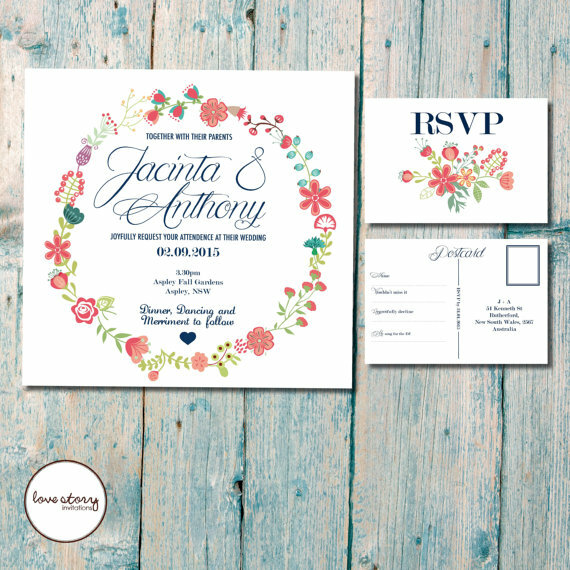 You can’t go wrong with these Light Romantic Floral Invitations with hand drawn floral illustrations! My Crayons Papeterie‘s wedding invitations are customizable with a variety of color options available so that they will match the beautiful color scheme you have chosen for your fairytale wedding! 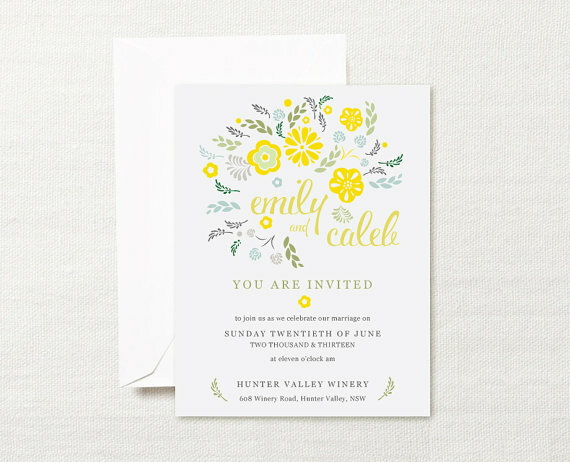 Whimsical Prints‘ Yellow Wedding Invitations are the perfect example of how a simple invitation can be absolutely gorgeous! 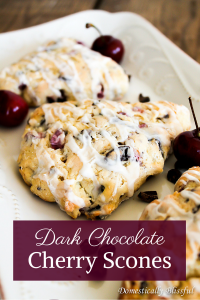 Check out their Etsy shop to see all of their beautifully whimsical invitations, programs, & thank you cards. 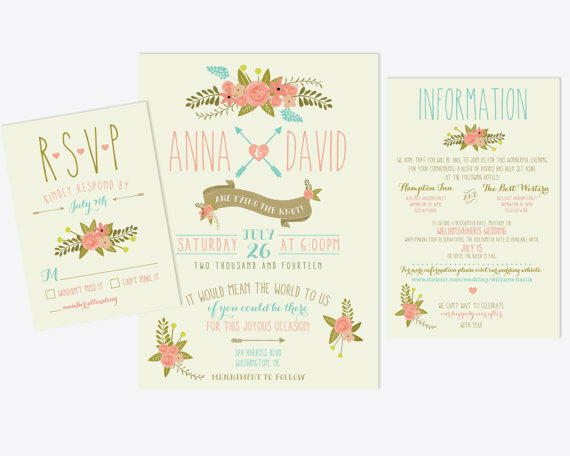 Love birds everywhere will flock to this adorable Mint Green & Coral Wedding Invitations. Inviting Moments has made these invitations completely customizable by allowing you the ability to change the words, font, & color! 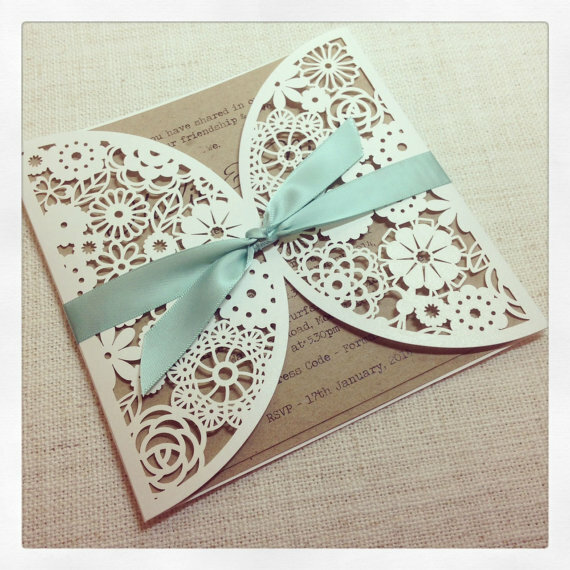 These Rustic Mint Laser Cut Wedding Invitations are breathtakingly beautiful. 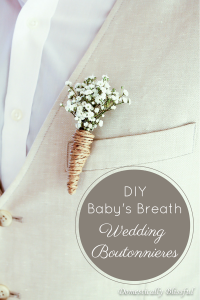 Your guests will be in awe of the lovely delicate details of these lace floral pockets. See more of Simply Stunning Stationary’s beautiful invitations on their Etsy store. 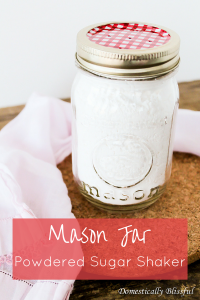 Notable Affairs has created the perfect mason jar inspired Wedding Invitations. 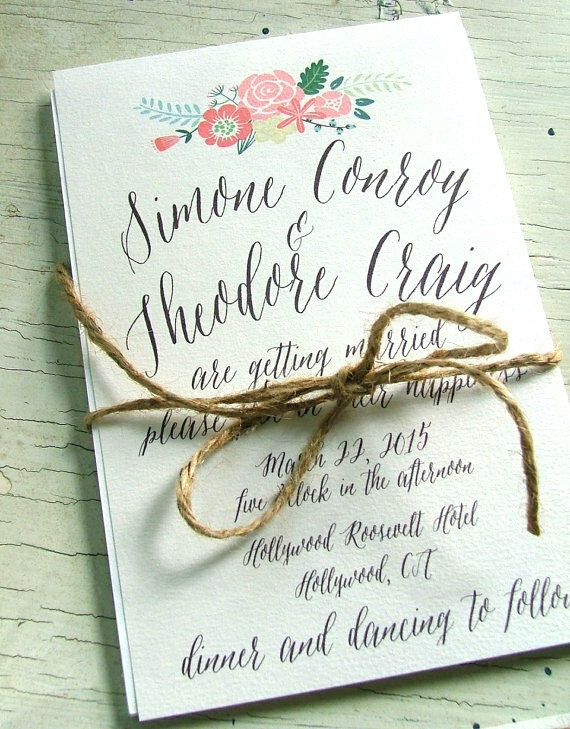 These invitations are perfect for an outdoor wedding with a rustic vintage theme. 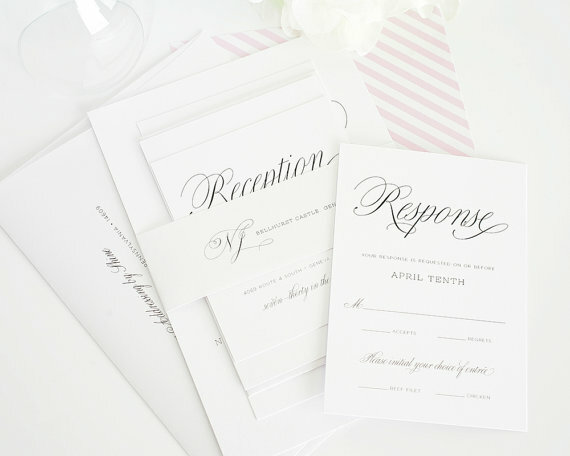 You can even customize your invitations by choosing one of the 21 available fonts! 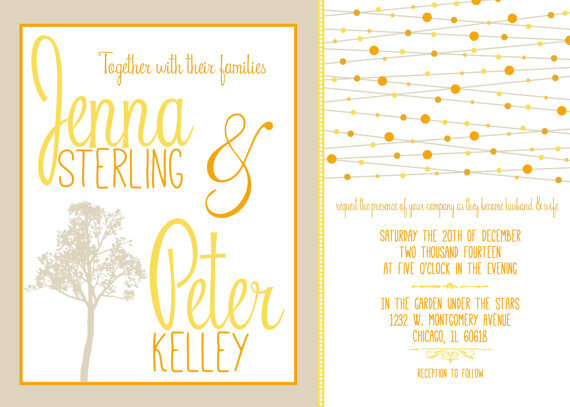 Wedding Invitation with Hanging Lights are the perfect first impression for your orange & yellow themed spring wedding. 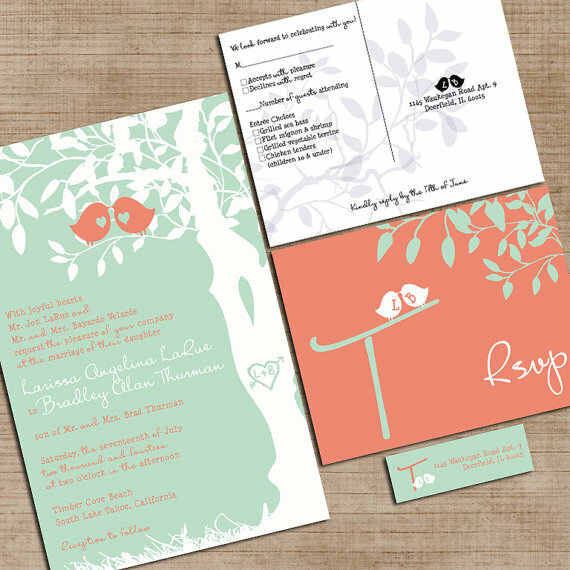 Lilygram Designs offers a large variety of beautiful invitations for all of your upcoming parties & special occasions. 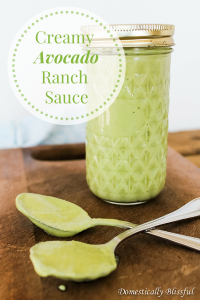 If you are looking for a mint invitation with a special sparkle Just Invite Me has created the perfect invitation for you! 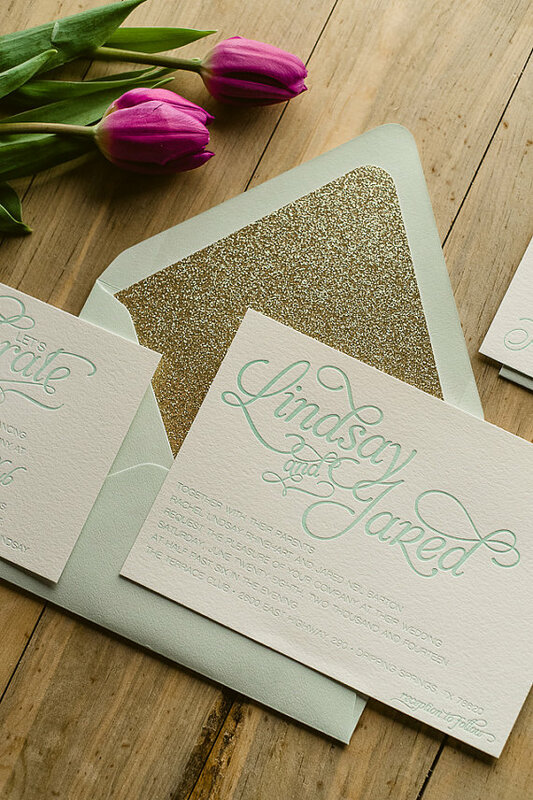 These Mint & Gold Glitter Letterpress Wedding Invitations are a beautiful first impression for your special day. I can only imagine how elegant your wedding will be with these gorgeous Grey & Peach Wedding Invitations. 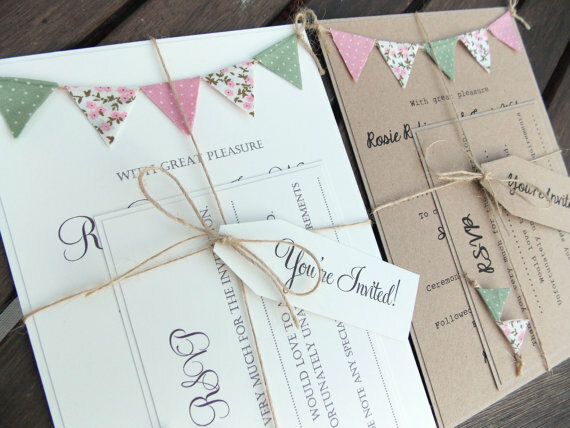 4LovePolkaDots has perfected these invitations down to the fancy font & dainty lace band. 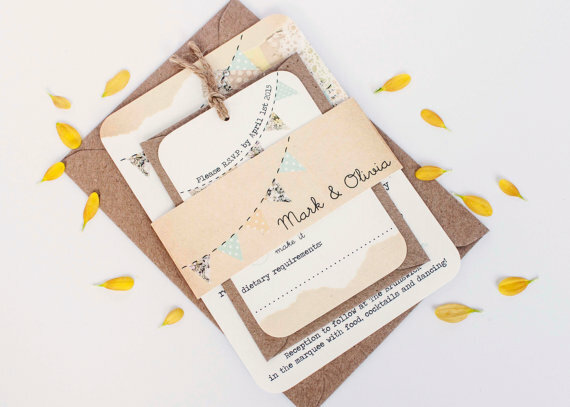 How adorable are these Country Bunting Rustic Wedding invites? 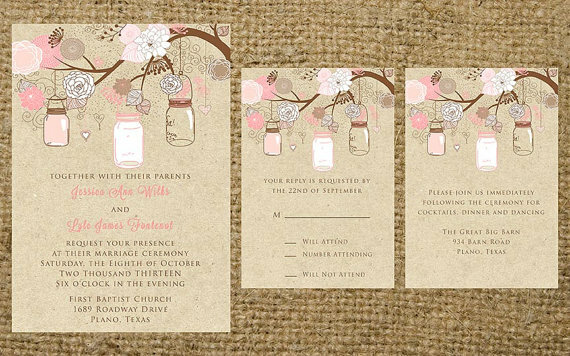 If you are looking for rustic & whimsical invitations Norma & Dorothy has a large collection of beautiful invitations along with other wedding paper products including save the dates & wedding menus! 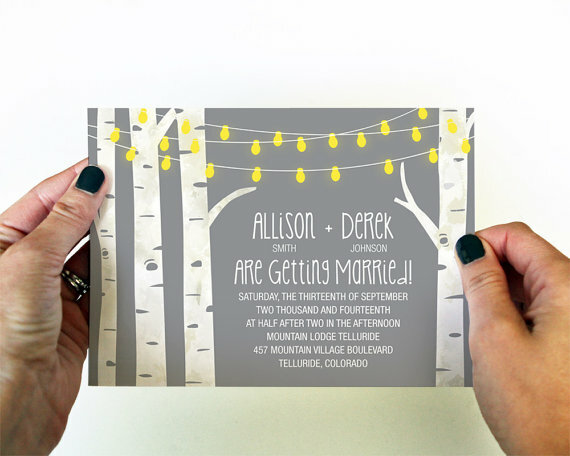 Birch Trees with String Lights Wedding Invitations are the perfect invitation for a magical evening wedding surrounded by all of your friends & family. Steffanie has several beautifully designed invitations over at Spotted Shop including one of a pair of Love Owls! 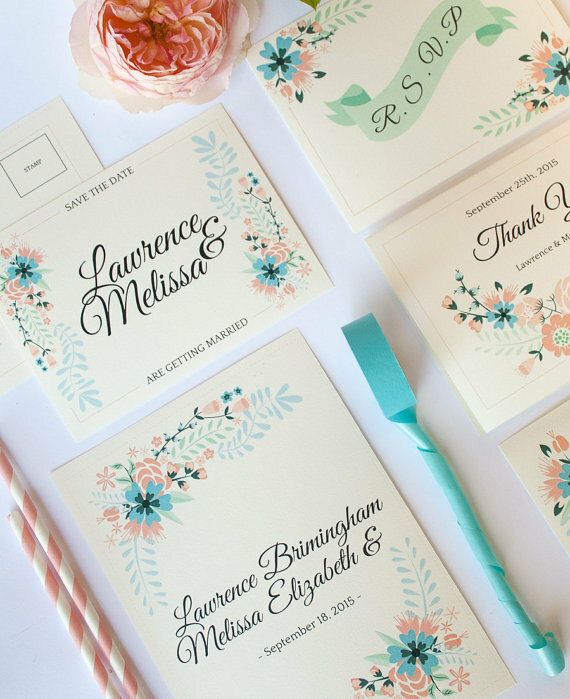 How adorable are these Illustrated Flower Wedding Invitations? 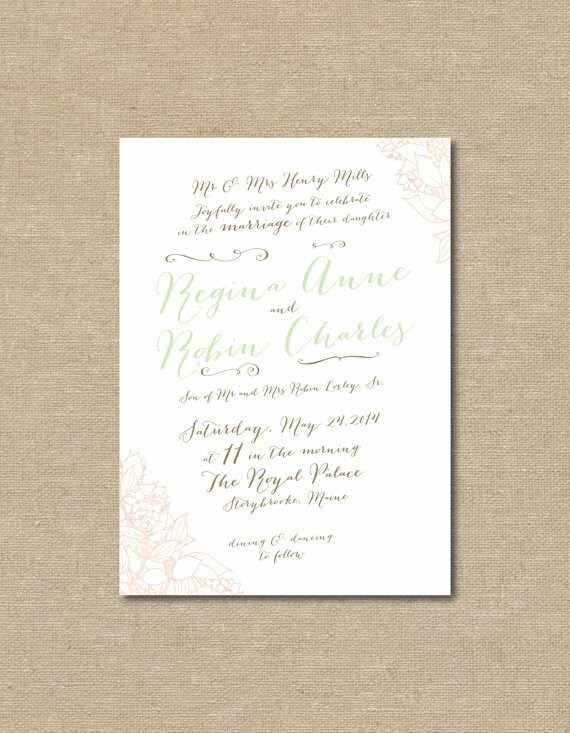 Charm Beloved Digital‘s invitations are perfect for a spring garden wedding with a beautiful array of soft spring colors. 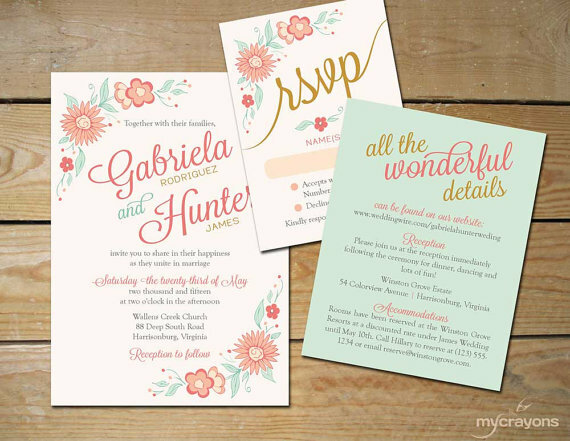 If you are looking for a more traditional spring wedding invitation Shine Wedding Invitations has a large array of wedding invitations. These Light Pink Wedding Invitations are just one example of the many simple & elegant wedding invitations they carry in their Etsy shop. 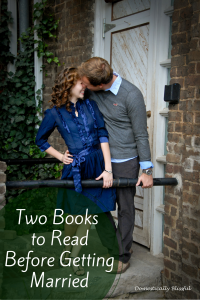 Want to stay connected with Domestically Blissful & keep up with the wedding series? 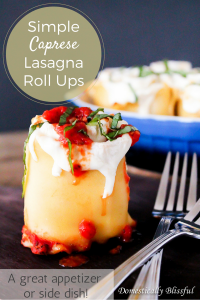 Don’t forget to follow on Facebook, Instagram, & Twitter!